The Rosette collection is a first-class series that I am already starting to collect, and this is going to be one of the best of the lot whatever else features among its future re-releases. The new title is 'The Harpsichord Collection', but I miss the original version 'The World of the Harpsichord' because that says something particularly significant about the playing of George Malcolm. Malcolm's playing is highly individual. It is notable for frequent and often startling changes of registration. I had to rub my eyes in near-disbelief as I listened to this account of Rameau's La Poule, but it is only the extreme instance. When I first got to know Malcolm's work 30-odd years ago he was still coming in for the tail-end of a tedious pipe-and-carpet-slippers fashion for sheer dullness and safe-averageness among English critics. This was already dead on any feet it ever had by that stage, and Malcolm came out a clear winner as Georgy Cziffra among others had not done. 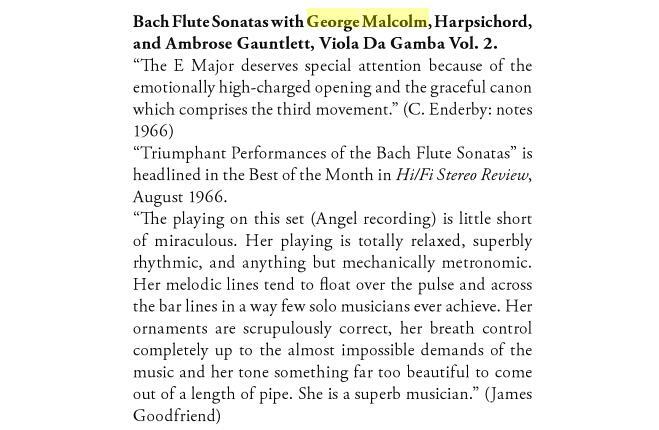 What you will get in any recital by Malcolm is not just an imperious finger-technique, deep stylistic grasp and superlative general musicianship, but a thorough demonstration of the capability of the instrument because if there is anything it can be made to do Malcolm will make sure we hear it. Obviously cases vary, and in Bach's Italian concerto that kicks off this selection the composer himself has taken care to a great extent of the types of registration to be used, some representing the 'solo' sequences, others the 'orchestral' parts, and Malcolm respects that absolutely. Next up is the Chromatic Fantasia, and here already Malcolm is becoming his familiar and once-controversial self. The choice of the remaining works seems to me a triumph in itself. There is some more Bach in the shape of the toccata in D and the 5th French suite, there are pieces by Rameau and Couperin plus a couple by Daquin and Paradies, and there are three more modern exhibitionist numbers that I find to be a complete knockout. In The Flight of the Bumble-bee I am in no doubt at all that Malcolm is challenging Horowitz. I haven't timed Horowitz, but there can't be much to choose between them for sheer fleetness, and Malcolm benefits from good recorded sound. He ends with a pastiche-Bach prelude and fugue in a jazz idiom by Alex Templeton, who is apparently Welsh despite such a Scottish name, and a witty pseudo-Bachian variation-fantasia of his own on The Sailors' Hornpipe, pulling a last surprise on us with his quiet ending. Imitation-Bach nearly always seems to work in my experience, and I have heard many an enjoyable and creative jeu d'esprit, more often than not from jazz musicians. The liner-note is anonymous but nowhere near as bad as many whose authors were unwise enough to give their names. I could probably have worked out for myself that 'Le Rossignol-en-amour depicts the nightingale in love', but its worst gaffe is in repeating the cliché that 'toccata' means 'a piece intended primarily as a display of manual dexterity, often free in form'. I have never had any idea what 'free in form' is supposed to mean, but the statement in general is palpably untrue of Bach's toccatas. The term is normally used to denote a kind of perpetuum-mobile etude, like the one from Paradies here or like Schumann's or Poulenc's. Bach's are a bigger and more varied kind of thing altogether. Tovey points this out, but it needs no Tovey, only a pair of ears, to give the lie to this statement in respect of the Bach toccata here. Otherwise the production is excellent in all essentials, although it would have been good to be told something about the instrument (it seems to be the same one throughout). The recorded sound does full justice to this magnificent and vivid playing, and the liner note is quite useful in terms of giving some basic background. The most important thing of all is that this great recital remains available to us. So how does it stand the test of time? Well, for one thing, I am surprised that this is a digital recording, the reissue sleeve notes make no mention of the fact (perhaps the Haydn is analogue), but also the sound has a warmth that I usually associate with analogue transfers. No question about the clarity though, it is a recording of pinpoint technological precision, where every line of counterpoint and every detail of instrumental balance is clearly reproduced. If this sounds like a 70s recording, it is because of the style and priorities of the sound engineering, not its quality. András Schiff, it turns out, was a pupil of the legendary George Malcolm, so any concerns about Cold War era culture clash are easily dismissed. The close communication and musical empathy between the two men is everywhere apparent. Many readers will be familiar with Schiff’s flowing, but always disciplined, approach to Bach, and that’s the way he plays it in this early recording. And George Malcolm gets exactly the same interpretation from his orchestra; both piano and ensemble sing, with warm lyrical lines, subtle but intelligently employed rubato and the sort of variety of articulation that, if it were performed like this today, could well have the power to resuscitate the tradition of Bach on modern instruments. So no danger of mechanical performance, and no danger Gould-like tempo extremes either. But while the performances avoid extremes, they never feel safe or middle-of-the-road. Where some period performers (and Glenn Gould) would be tempted to propel the outer movements with fast tempi, Schiff achieves an inner propulsion in the counterpoint that gives these movements all the life they need. And in the slow middle movements it is all about cantabile. The audio ensures that bass lines and counterpoints are all represented, but this music revolves around the melodic line, to spectacularly beautiful effect. A classic recording of power and pathos that still ranks as one of the most striking interpretations of Renaissance music ever released. I suspect that the tempestuous reputation we attribute to Victoria in particular spans from several earlier and influential recordings, chiefly, Westminster Cathedral's hair-raising 1960 recording of the Responsories for Tebebrae (also from 'Officium Hebdomadae Sanctae') directed by George Malcolm. A long tradition of singing Victoria at Westminster Cathedral still thrives, and shades of their steely continental tone have continued to dictate a gutsy style that many others have tried to copy. We know Victoria today for his penitential music, especially his glorious Requiem of 1605 and the Tenebrae Responsories which were immortalised by George Malcolm’s legendary interpretation when he was Master of the Choristers at Westminster Cathedral back in the 1960’s. Yet many modern British ensembles find the abundance of Spanish imagery that feeds into our national subconscious a red rag to a bull (if you forgive the reference). Such large, solid textures often become gateways to the pursuit of Spanish flavour. I suspect such vocal heroics originate from Westminster Cathedral Choir who are preeminent in the performance of Victoria’s music. The first choirmaster of Westminster Cathedral (appointed in 1896) was Sir Richard Terry, an early pioneer in the revival 16th-century polyphony and the tradition he began is discernable in George Malcolm’s hair-raising 1959 recording of Victoria’s Responsories for Tenebrae with the cathedral choir. The passion and sheer energy on this disc is unforgettable; and it is still some of the finest treble singing that I have ever heard. (Incidentally, this recording is from the same year that they recorded Britten’s Missa Brevis). 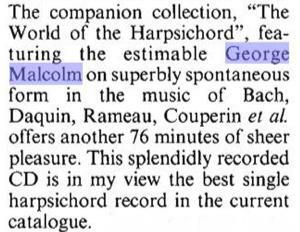 George Malcolm was a fine exponent of the harpsicord. I remember some of the lighter items on this disc on an EP 45rpm record in my late father's collection. This disc offers a variety of classic items, beautifully played. It also adds the lighter items of Back Goes to Town and Bach Before the Mast. These could almost be Bach! The other May disc was Victoria's Responsories for Tenebrae sung by the Westminster Cathedral Choir under George Malcolm. This was particularly welcome because now that the reformed rites of Holy Week are in use, one has little chance of hearing this great music. The singing is splendid, dramatic and fervently emotional as occasion demands, no "cathedral" gentility or hooting here: and the disc is also a souvenir of Malcolm's distinguished period of service at Westminster Cathedral, now alas at an end (Argo Q RGI49: o ZRG5149). Conversely, some self published performances, air checks, and older recordings I found fascinating and delightful. Chief among the latter was the fantastic set by the late, great Elaine Shaffer, wife of conductor Efrem Kurtz. Shaffer was a very musical player who died of cancer before she was fifty and shortly after completing the Bach recording. Shaffer loved Bach and it shows. The lines develop beautifully and nothing is forced. Shaffer’s recording would be one to look for. Mine is on a treasured LP. Which brings me to my favourite performances of these masterpieces. Any of which will satisfy as a complete set on CD or chosen one Sonata at a time on iTunes. Musically, they are all so wonderful that they are interchangeable as first choices. Choose either or all with confidence. 3. Julius Baker with Sylvia Marlowe, harpsichord (1947). 2. Elaine Shaffer with George Malcolm, harpsichord (1973). 1. Aurèle Nicolet with Karl Richter, harpsichord (1969). The previously mentioned Elaine Shaffer recording is in my top three for its glorious HMV recorded sound (audiophiles, you should hear this LP on a well setup turntable and quality cartridge — incredible presence and immediacy), the superb pair of George Malcolm and Ambrose Gauntlett as accompanists, and for Shaffer’s musicality and consistency in interpretation. As movements, they just work. Natural Bach. No affectation. No nonsense. 1. The LSO/Malcolm is seemingly the only recording ever made of the Cantata Academica, and has many thrills and spills. The best of these is undoubtedly Vyvyan’s wonderful arioso solo, worth the outlay for the disc on its own. 2. George Malcolm conducts the Westminster Cathedral Choir (in the Missa Brevis) and attains the sound that inspired Britten to write the piece in the first place, with a brightness of texture and an effervescent organ accompaniment. 3. Once again, though, Britten’s own version (of Rejoice in the Lamb) is the one to have, sharply responsive and, in George Malcolm, offering the best interpretation of the organ flourishes. The Temple Church Choir deserve a mention, too, for theirs is a wide-ranging account of depth and passion, and the Finzi Singers on Chandos show a wealth of different tones and colours. 4. The differences between the versions (of A Hymn to the Virgin) are striking. An expansive reading such as Malcolm’s, rich in vibrato and indulgent in the time taken in and between phrases, is almost a whole minute longer than the Holst Singers under Stephen Layton, whose purity of expression and line feels much more chaste and appropriate.